How much do artists actually make from streaming services? Home Culture How much do artists actually make from streaming services? Up until the last few years, I prided myself on still buying CDs out of some sort of notion that it made me a “real music fan.” Aside from enjoying the tangible, physical form (my bedroom is covered floor to ceiling in artwork from albums), I wanted to do my part to support the artists I liked. I knew the artists didn’t make all that much off album sales. However, I also knew it had to be more than the royalties they were receiving from iTunes and the like. While all of my friends snagged iPods during the digital music revolution, I was the fool still rocking the portable CD player. Then I was hit with the fiscal reality of being a college student. It no longer seemed feasible to be shelling out upwards of $60 dollars a month (~4 albums) just for music. Coincidentally, this was right around the time that Spotify crossed the Atlantic and became available in the US. Instantly, the way I consumed music changed forever. While it quickly became clear that streaming is beneficial for the music industry overall, I have always had reservations about how artists were impacted. Exactly how much were they being compensated for users listening to their tunes? Thanks to the good folks at Digital Music News and Information is Beautiful, we have an accurate picture of how independent artists fare on each of the major platforms. It’s important to note that these numbers only apply to independent acts. Artists with label representation receive variable payouts based on their contracts. Do these figures surprise you? I honestly thought the platforms with the largest user base would be able to pay out the highest rates, but the trend shown above is exactly the opposite. One important factor to consider here is that some of these services have vastly different business models. Platforms with the “freemium” approach (Spotify, YouTube) are not able to offer the same rates that platforms with only paid subscriptions (Napster, Apple Music) can. The below infographic, also courtesy of Information is Beautiful, includes another figure that adds a human element to the cold statistics. 380k Spotify streams in a single month just to earn minimum wage? Ouch. 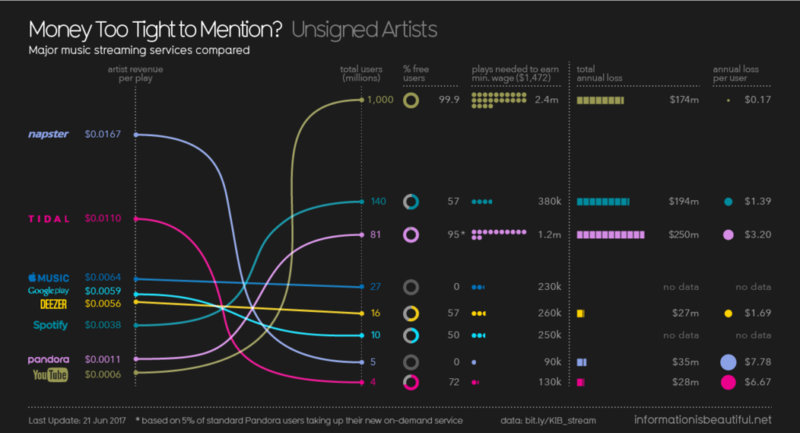 So, what do all of these numbers mean to you, the dedicated music fan? Ultimately, it means you’re going to have to go the extra mile to support your favorite artists, especially if they are unsigned. Don’t hesitate, go to that show. Buy their merch. 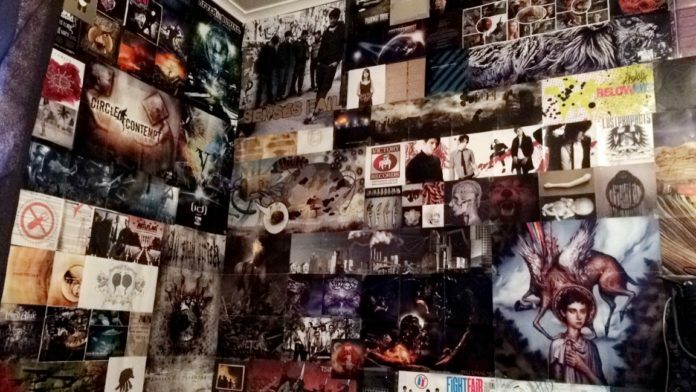 You would be surprised how much bands can make off selling merchandise… but that’s a topic for another day. How do you feel about these numbers? Let’s talk about it on Twitter.